Conrad Black at the National Revue Online delivers a lengthy overview of the current state of the GOP race in a style reminiscent of George Will in his Reagan years heyday. I especially like his Warren G. Harding like byline photo-it challenges one to a game of “stare down.” These sort of people hold no fears for me and face to face, if they are not taken seriously, it is an easy matter to look them squarely in the eye. Verging on the pompous and aristocratic (Hegel, Goethe, Madison make an appearance) he attributes to the GOP voters some blind watchman’s method of selecting the non-Romney’s. 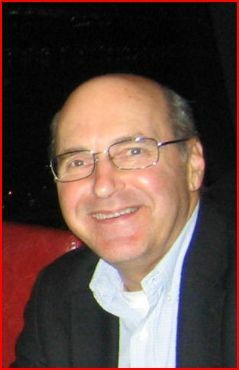 They, the hoi polloi have, through the mechanism of Hegalian dialectics chosen the one candidate, Gingrich, who has been, to Black’s admitted surprise, he is human after all, the only one who can stay the course. The course does not run, it appears all the way to the nomination, sadly for Gingrich and his supporters, rather it blocks Romney receiving it advises Black. Gingrich is the one, chosen by pure dumb luck it appears, whose “scandals” are so pervasive and well known that he is immured against the sort of attacks, that have so effective against all the previous “non-Romney’s” by the leftist media , the Obama team, and the GOP adversaries. Thus his ill fated, but useful saga, can run all the way to the convention. How the rank and file, who are apparently more conservative than in any year since the Goldwater run, will accept Bush is not mentioned. How the GOP would imagine the country is ready for another Bush-even “the clever one” is also not addressed. This possibility, a woman being drafted, would eventuate from a very narrow field indeed. Condoleezza Rice is the only Republican woman with the experience and profile that I can think of, apart from one other, who might be the chosen one. I have written some time ago (Palin/Condolleeza a Ticket For The Ages) that Rice would be an ideal VP candidate-a concept that has more recently been taken up by “Smitty” at the influential “The Other McCain” site. “The Washington Times” also floated the concept in a major profile. A Rice vice-presidential candidacy has many positives as we all set out. However it is a stretch to imagine she would be drafted for president. Clearly there is only one woman who fits the Conrad Black prescription and that is, of course, Sarah Palin. the fact is that she has not endorsed any of the current candidates, nor has she entirely ruled out being a candidate (“it would take an earthquake” is not “no”). It may be that, as I wrote recently, Palin will turn out to be a genius for having avoided this embarrassing GOP candidates circus. Fair use notice:This website contains copyrighted material, the use of which may or may not have been specifically authorized by the copyright owner. Excerpts of such material is made available for educational purposes, and as such this constitutes ‘fair use’ of any such copyrighted material as provided for in section 107 of the US Copyright Act. In accordance with Title 17 U.S.C. Section 107, the material on this website is distributed without profit to those who have expressed a prior interest in receiving the included information for research and educational purposes. Original material published on this website may be excerpted and the excerpt reproduced for the purpose of critical reviews. However, such original material may not be reproduced in full on another website or in any manner without prior approval from this website’s owner. In all cases when material from this website is reproduced in full or in part, the author and website must be credited by name and a hyperlink provided to this website. 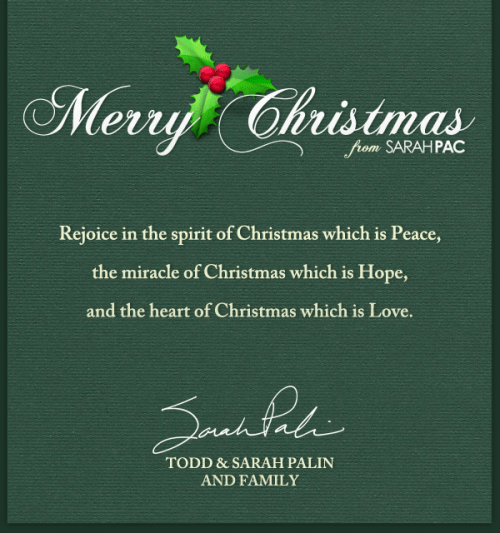 Following is the email Christmas Card being sent to SarahPAC donors and email registrants. It is similar to the physical card some supporters have received. Thank you, Sarah and Todd. We wish you and your family a Merry Christmas and Successful New Year.